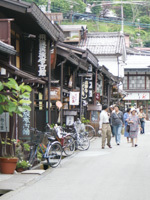 Do you like to visit Takayama and Shirakawa-go from Nagoya City? We offer private tours to Takayama and Shirakawa-go from Nagoya. If you need a guide, currently guides from Nagoya are available in English, Chinese, Spanish, French and Portuguese. The table below indicate our popular plans and typical prices. Please enquire for a large group. Tour by public bus is not recommended due to inflexibility of the schedule and the difficulty to book it. 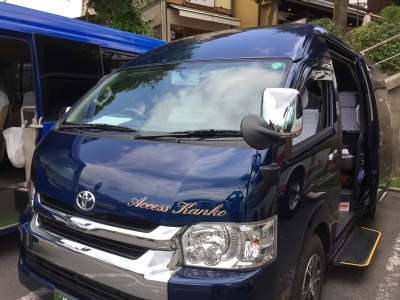 A bus company gives us a special offer of their 14-seater (including driver's seat) van or 18-seater minibus from Nagoya. This is the most recommendable tour plan for groups of up to 17 pax for Takayama and Shirakawago. Arrangement of lunch in Shirakawago is available for a group of 5 or larger. See this page. The popular traditional set menu with Hida beef is 1,620 yen per person. Price of the tour is fixed at 120,000 yen (14-seater van) and 130,000 yen (18-seater minibus) including driver, highway tolls, parking fees, an English-speaking guide, and 8% tax. Meals and entrance fees are not included in these prices. If some of you speak Japanese, then you may not need a guide and you may get 20,000 yen discount. During Christmas and New Year's holiday season, high season rate is applied. Please note that 14-seater van does not have enough space for luggage. So if you have large suticases, then choose a minibus. There is only one each of van and mini-bus available a day. So please ask for the availability. To go from Nagoya to Takayama and Shirakawa-go, there are choices of transportation. You have to choose the best means of transport for you by considering cost, flexibility, capacity, time, etc. If you choose a tour by car, it gives you the maximum flexibility but can be more expensive. If you use a tour by bus, it's the cheapest but you cannot expect flexibility. If you are a group of four or more, and especially with children and/or elderly people, we strongly recommend to take tour by car. Tour duration is shorter and the itinerary can be more flexible. We give you advice to choose the most suitable option for you. Arrangement of meals is also available. In addition to popular food such as Hida beef, soba noodle and Takayama ramen, there are Muslim and vegetarian lunches available. If you are not interested in private tours and looking for an inexpensive packaged tours from Nagoya, then visit Packaged Tours from Nagoya to Takayama/Shirakawago. This tour is operated by a large touring company. Our popular tours are shown below. If your group is large (over 12 people), you need more customizing, you need special arrangements, etc., please contact us from this page. All schedules are subject to change. Prices are estimates to give you general ideas about the costs. All tours include a guide accompanying you from Nagoya. If you need booking of transport and/or accommodations without taking our guided tour, a service charge for booking is applied. Overnight stay in Takayama/Shirakawago and tours including Gokayama, Kanazawa and/or Gujo Hachiman also available. Please inquire. This is the most recommendable tour plan for small groups. Duration of tour is 10 hours and time and schedule can be flexible. Meals and admissions can be included upon request. Prices below are just estimates. Price varies slightly depending on the types of the car available on the day of the tour. Prices include a car with driver, highway toll, parking fees in Takayama and Shirakawago, an English-speaking guide, and 8% tax. Prices are subject to change depending on the type of the car, etc. You can include lunch and admissions to the quotation. Please inquire. If you like to include Gokayama (Suganuma Village or Ainokura Village), you need additional 2-4 hours. Tour price will be higher due to the longer hours. Please inquire. We recommend early booking otherwise train seats may not be available especially in holiday seasons. If you like to visit Gokayama (Suganuma Village or Ainokura Village), you need to leave earlier and shorten the stay in Takayama and Shirakawago. Tour price will be higher due to the longer hours. Meeting point is Nagoya Station. Hotel pick up is available with additional fees for transportation of our guide. Groups with 9 people or over need buses. Contact us from here. Price varies according to the size of your group (car size), and the train tickets. Those who have JR Pass pay for car (and guide) only. Table below shows the price of car hiring from Takayama to Shirakawago for 4 hours (including highway tolls and parking fees) without guide (self-guided tour). The price of a return tickets varies from season to season. During the low season, a special discount ticket is available at JR ticket counter. The price of this special ticket is same for children. Tickets are available at JR ticket office. We can purchase the train tickets for you and send them to your hotel. Service and posting charge is from 5,000 yen. An exclusive Shirakawago VIP tour from Nagoya is also available. See here.